Last week K and I took a short camping trip. In the past we've done camping trips of a week or longer, but we've both been busy with work and other commitments and scaled this year's trip down to four nights. We split that between two locations, Manresa State Beach near Monterey, and Pinnacles National Park, near, well, not much of anything most people have heard of. It was an amazing trip. Near Manresa we saw dolphins, whales, otters, California brown pelicans, quail, and various seabirds and shorebirds, including endangered snowy plovers. We also spent a lot of time just walking along the beach, watching the waves, and lamenting the the lack of bear boxes as we watched some raccoons eat the rest of our lasagne that was supposed to be lunch on day 2. After two nights there our reservation was up, so we headed to the east side of Pinnacles National Park. Our route went through historic San Juan Bautista, so we stopped to check out the mission and had a great vegan lunch at the Natural Wonders Health Food Store Deli. San Juan Bautista was also on the route of Juan Bautista de Anza and his historic journey leading some of the first European settlers to the Bay Area. Once we got to Pinnacles, we picked out a campsite, set up our tent, and got the lay of things. It's not a big park by national park standards, but there's a lot to see. Even just around our campsite there were tons of birds to watch, including quail, wild turkeys, acorn woodpeckers, and turkey vultures. The next morning we drove further into the park and went on a short hike. A relatively short hike took us through caves that are home to several species of bats, and California red-legged frogs, and to a small reservoir where we got an amazing treat. While we sat on a rock enjoying the view, a juvenile peregrine falcon landed 10-15' from us and looked us over for a while before flying off. There are only two nesting pairs in the park, so they're even less common than the 25 or so California condors that call the park home. Seeing one is a treat; having it land next to you for a close look is unbelievable. We hiked around more and enjoyed the views, then returned to our camp to relax during the worst heat of the day. At dusk, we got another treat as we watched a bobcat stroll 25-30' from where we were sitting. After dinner we waited until full dark. 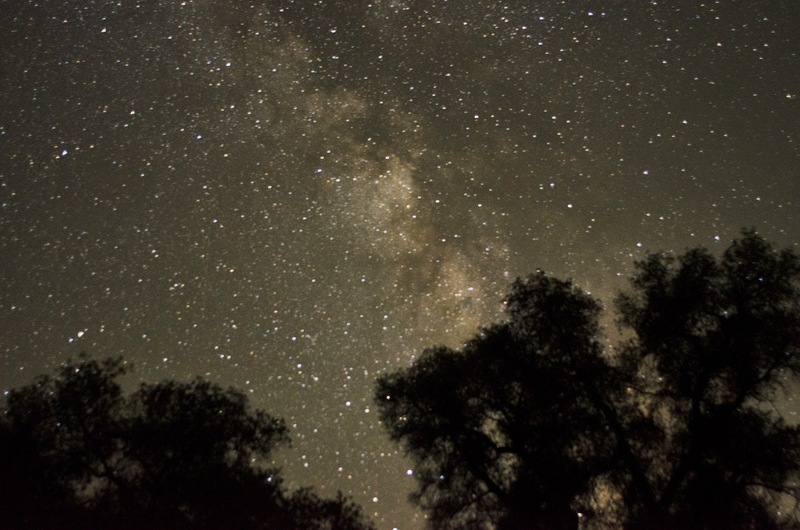 We could see a lot of stars and the Milky Way galaxy from our campsite, but the light from the campground was a bit of distraction, so we went to a nearby viewpoint where we could get true darkness. My attempts at astrophotography were OK, but I really think seeing the Milky Way live in the night sky is something everyone on earth should see. It wasn't until we hit some traffic in San Jose that we turned on the radio and heard about the earthquake in Napa. It's always a bit jarring to return from extended time in nature to the metropolis of the Bay Area, but it was doubly so with the strange news. Thanks for taking us on your trip. My favorite photo is the one you took of the starry, starry night. I still have some to learn about the best settings for astrophotography, but I love how it turned out.